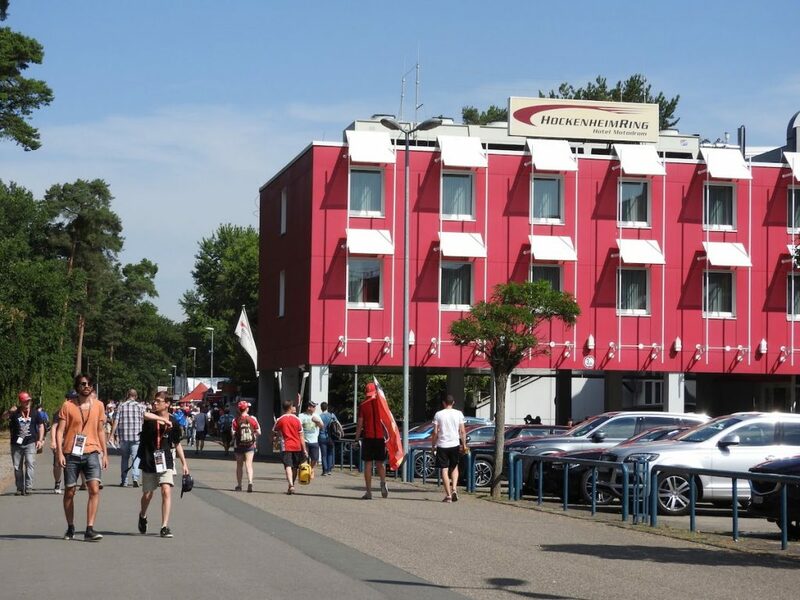 Where to stay near the Hockenheimring for the 2019 German Grand Prix on July 26-28, 2018. Support the future development of F1Destinations by reserving your accommodation through the Booking.com links on this page. You won’t pay more and we receive a small commission. We also recommend adding accommodation to your Official Ticket Package from F1 Experiences. If you are planning to visit the Hockenheimring on a non-race weekend, it’s possible to stay right at the track in the Hotel Motodrom. The hotel, main picture above, has 3 stars and makes a great base for those keen to explore the circuit and surrounds. 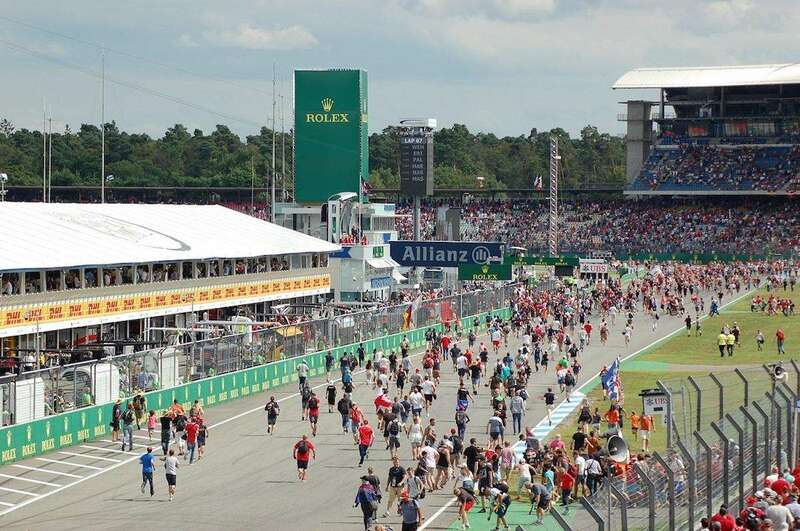 The most convenient and popular place to stay for the German Grand Prix at the Hockenheimring is trackside camping. If you don’t want to rough it, then you’ll need to stay in one of the larger towns nearby, such as Heidelberg or Mannheim, as accommodation closer to the track tends to get booked out very early. With the race around six months away, Mannheim has the best selection of mid-priced hotels with availability. Further afield, don’t discount staying in the larger cities of Frankfurt to the north or Stuttgart to the south, though the daily commute to the circuit gets more difficult (congested roads, overcrowded trains) as the weekend progresses. 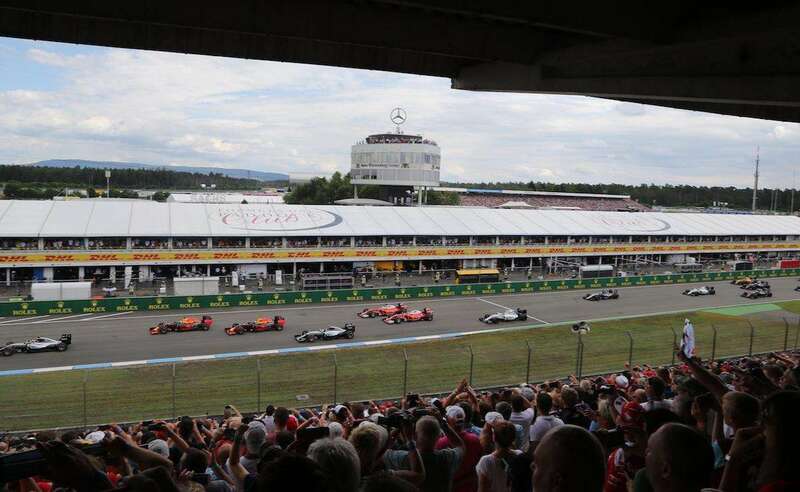 Official Ticket Packages from F1 Experiences to the 2019 German Grand Prix include select grandstand seats and access to VIP hospitality in the Champions Club and Formula 1 Paddock Club. Add accommodation to your package at the nearby ACHAT Premium Walldorf/Reilingen Hotel, where many of the teams and drivers stay. Daily transfers to and from the circuit are included for hotel guests. Camping remains popular during the traditional European summer racing season, and Hockenheim is no exception. Thousands of fans from Germany and all over Europe camp at one of the many campsites within walking distance of the circuit. Prices are reasonable, though some sites can get a little drunken and rowdy. The best aspect of camping is that you don’t need to battle the road traffic or overcrowded trains and buses to get to the circuit each day. Pitches for cars or motorbikes (up to 2 persons) cost €120 for up to five nights from Wednesday to Monday. Caravans and camper vans cost €140 for the same period. Additional persons on your pitch cost €40 each. Reservations are necessary. Online sales via the circuit have not yet launched, but you can call the circuit on + 49 6205 950 211 or email to book your pitch. Alternatively, you can book online here but the prices are higher. Download the Hockenheimring camping map. Double room from €155 per night. Apartments with kitchenettes also available. Where do you recommend staying near the Hockenheimring? Leave a comment! I have been a formula 1 fan for more than 25 years so when my family and I planned a vacation to Paris this summer I naturally wanted to see if the dates match any Grand Prix dates. I will be in Paris on the weekend of the German Grand Prix on July 22, 2018. I see that I can purchase race day tickets on your site, do you have tickets you can recommend, mid level grandstands at $300-$400 is probably my upper limit. Also do you know if there are travel options from Paris on the day of the race? I am not sure I will be able to be away for the entire weekend with a Saturday night stay close to the track as it depends on cost or just travel early Sunday morning to the track and late Sunday back. Hi Randy, I’d choose one of the lower priced North Tribune tickets (Red A or C). I’d take a look into flights to either Frankfurt or Stuttgart, and then hire a car for the day. Make sure you don’t book a return flight before at 9 or 10pm after the race. Good luck! Hi there, Myself and my 81 year old father are booked for Hockenheim and have tickets for the South Business Suite, We have booked a hotel in Heidelberg, We have a car for the weekend but an wondering what is the best way to get too and from the circuit?????. Any tips and rough costs would be much appreciated. Take the train. You’ll need to get yourself to Heidelberg Hbf, or Central Station. Take a train to Hockenheim, then the free shuttle to the circuit. It’s quite efficient and affordable. Leave the car back at your hotel in Heidelberg. Up to you, but then you will have to battle the traffic. Maybe drive on Friday and Saturday when there are less fans, then take the train/bus on Sunday? Hi, just wondering how frequent the trains are after the race, going from Hockenheim to Mannheim? I noticed that the trains to Hockenheim in the morning on race day are only one per hour – or do they put more trains on for after the race? We have weekend tickets for the Mercedes Tribune and we are staying in Berghausen (Pfalz) about 15km from the Circuit. What are the parking options near the Mercedes Tribune and should we go by car at all or are there other better options to park somewhere nearby and walk, we don’t mind anything less than a 30min walk.